(MENAFN - Pajhwok Afghan News) KABUL (Pajhwok): Japan announced $11.6 million in new assistance for road projects in line with Kabul City Master Plan under an agreement signed at the Embassy of Japan here on Wednesday. The projects include construction of Maslakh Road, the Abdul Haq Roundabout as well as a new Makroyan Bridge, according to a statement from the Embassy of Japan in Kabul. 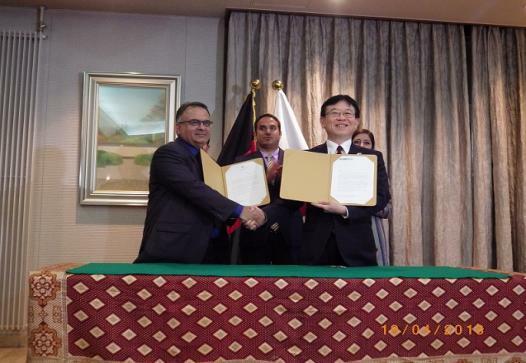 The agreement signing ceremony was attended by Japanese Ambassador Mitsuji Suzuka, Director and Representative ad interim Amjad Muhammad, UNOPS Afghanistan, Acting Mayor Abdullah Jan Habibzai, Director of Plan and Policy, Kabul Municipality Sahar Hamdard and NOORI € Director of Kabul District 9. Mohammad Sediq. The embassy said the project for improvement of access in the southeast area of Kabul city will provide better access to services and boost economic development, which will positively impact the lives of 4.5 million beneficiaries residing in the rural and urban areas of Kabul. Japan has been engaged in a very close cooperation with Kabul Municipality since 2008 through the Kabul Metropolitan Area Development Programs through JICA. Until now, about 70 km of main and community roads in Kabul City have been improved through its assistance. The new project aims to facilitate smooth traffic between the southwest and east of Kabul for boosting economic activities by removing the traffic bottleneck from the city center to Jalalabad Road and linking southwest Kabul with east. UNOPS Afghanistan€™s Director and Representative ad interim, Mr. Amjad Muhammad expressed his gratitude to Kabul Municipality for its continuing cooperation and long-lasting partnership, and renewed UNOPS€™ commitment to fully support the Municipality and to improve the lives of the Afghan people. Japan has been assisting Afghanistan€™s nation-building efforts in various fields including security, infrastructure, agriculture, rural development, human capacity development, education, health, culture and humanitarian assistance. The cumulative Japanese assistance to Afghanistan since 2001 amounts to approximately $6.6 billion.